The French Navy, informally "La Royale", is the maritime arm of the French Armed Forces. Dating back to 1624, the French Navy is one of the world's oldest naval forces. It has participated in conflicts around the globe and played a key part in establishing the French colonial empire. The Royal Navy maintains a fleet of technologically sophisticated ships and submarines  including two aircraft carriers, two amphibious transport docks, four ballistic missile submarines (which maintain the UK's nuclear deterrent), six nuclear fleet submarines, six guided missile destroyers, 13 frigates, 13 mine-countermeasure vessels and 22 patrol vessels. As of November 2018, there are 74 commissioned ships (including submarines) in the Royal Navy, plus 12 ships of the Royal Fleet Auxiliary (RFA); there are also five Merchant Navy ships available to the RFA under a private finance initiative. The RFA replenishes Royal Navy warships at sea, and augments the Royal Navy's amphibious warfare capabilities through its three Bay-class landing ship vessels. It also works as a force multiplier for the Royal Navy, often doing patrols that frigates used to do. 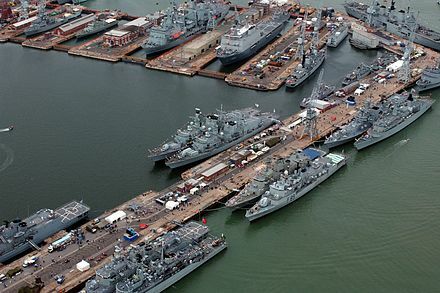 The total displacement of the Royal Navy is approximately 408,750 tonnes (743,759 tonnes including the Royal Fleet Auxiliary and Royal Marines). The Albion-class landing platform dock is a class of amphibious assault ship in service with the Royal Navy. 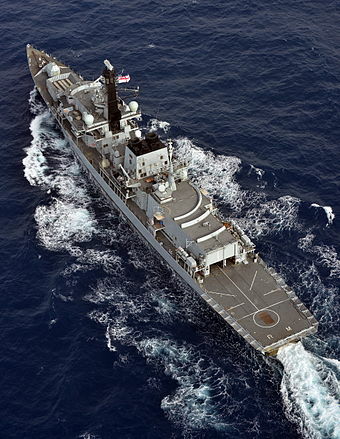 The class consists of two vessels, HMS Albion and HMS Bulwark, ordered in 1996 to replace the ageing Fearless class. Both ships were built by BAE Systems Marine at the former Vickers Shipbuilding and Engineering yard in Barrow-in-Furness. Albion was commissioned in 2003 and Bulwark in 2004. Each of the ships has a crew of 325 and can accommodate up to 405 troops. Thirty-one large trucks and thirty-six smaller vehicles and main battle tanks can be carried inside the vehicle deck. To disembark troops and vehicles, the vessels are equipped with eight landing craft. 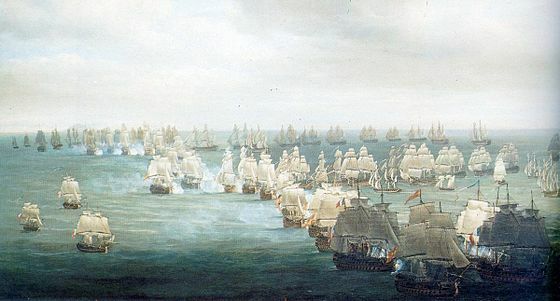 The Battle of the Saintes (1782). On the right, the French flagship, Ville de Paris , in action against HMS Barfleur. The Type 23 frigate or Duke class is a class of frigates built for the United Kingdom's Royal Navy. The ships are named after British Dukes, thus leading to the class being commonly known as the Duke class. The first Type 23, HMS Norfolk, was commissioned in 1989, and the sixteenth, HMS St Albans was commissioned in June 2002. They form the core of the Royal Navy's destroyer and frigate fleet and serve alongside the Type 45 destroyers. Originally designed for anti-submarine warfare in the North Atlantic, the Royal Navy's Type 23 frigates have proven their versatility in warfighting, peacekeeping and maritime security operations around the globe. Thirteen Type 23 frigates remain in service with the Royal Navy, with three vessels having been sold to Chile and handed over to the Chilean Navy. The Royal New Zealand Navy is the maritime arm of the New Zealand Defence Force. The fleet currently consists of ten ships and eight naval helicopters. The South African Navy (SAN) is the naval warfare branch of the South African National Defence Force. The role of the navy is to prepare for and to conduct naval operations in defence of the South African state, its citizens and interests and to carry out peacetime operations in support of other national objectives. The Argentine Navy is the navy of Argentina. 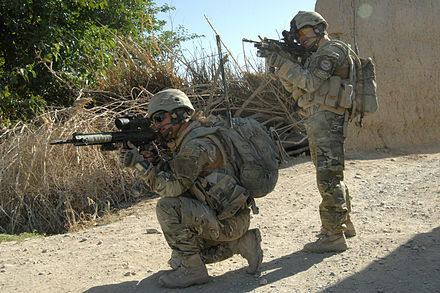 It is one of the three branches of the Armed Forces of the Argentine Republic, together with the Army and the Air Force. At the beginning of the 1990s the Royal Navy was a force designed for the Cold War. The main purpose of its fleet, based around three small aircraft carriers and a force of anti-submarine frigates and destroyers, was to search for, and destroy if required, Soviet submarines in the North Atlantic. The 1982 Falklands War also demonstrated a requirement for the Royal Navy to maintain a global reach and expeditionary capability. Standing Royal Navy deployments is a list of operations and commitments undertaken by the United Kingdom's Royal Navy on a worldwide basis. The following list details these commitments and deployments sorted by region and in alphabetical order. Routine deployments made by the Navy's nuclear-powered submarines and their location of operations is classified. The Royal Malaysian Navy (RMN) is the naval arm of the Malaysian Armed Forces. The Royal Scots Navy was the navy of the Kingdom of Scotland from its origins in the Middle Ages until its merger with the Kingdom of England's Royal Navy per the Acts of Union 1707. There are mentions in Medieval records of fleets commanded by Scottish kings in the twelfth and thirteenth centuries. King Robert I, developed naval power to counter the English in the Wars of Independence (1296-1328), and after the establishment of Scottish independence continued to build up naval capacity. In the late fourteenth century naval warfare with England was conducted largely by hired Scots, Flemish and French merchantmen and privateers. King James I, took a greater interest in naval power establishing a shipbuilding yard at Leith and probably created the office of Lord High Admiral. The Sri Lankan Navy is the naval arm of the Sri Lanka Armed Forces and is classed as the country's most vital defence force due to its island geography. The SLN is responsible for the maritime defense of the Sri Lankan nation and its interests. 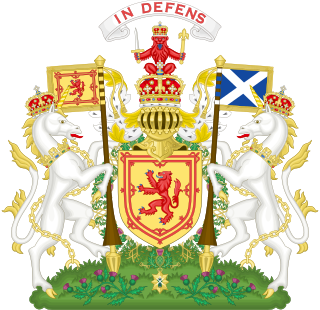 Historically, Scotland has a long military tradition that predates the Act of Union with England. Its soldiers form part of the armed forces of the United Kingdom, more usually referred to domestically within Britain as the British Armed Forces. A depot ship is an auxiliary ship used as a mobile or fixed base for submarines, destroyers, minesweepers, fast attack craft, landing craft, or other small ships with similarly limited space for maintenance equipment and crew dining, berthing and relaxation. Depot ships may be identified as tenders in American English. Depot ships may be specifically designed for their purpose or be converted from another purpose. HMAS Gawler (J188/B241/A115), named for the town of Gawler, South Australia, was one of 60 Bathurst-class corvettes constructed during World War II and one of 20 built for the Admiralty but manned by personnel of and commissioned into the Royal Australian Navy (RAN). The ship was laid down by Broken Hill Pty Co Ltd in early 1941, launched later that year, and commissioned in 1942. Navy Command is the current headquarters body of the British Royal Navy, and its major organisational grouping. It is a hybrid, neither a command, nor simply an installation. 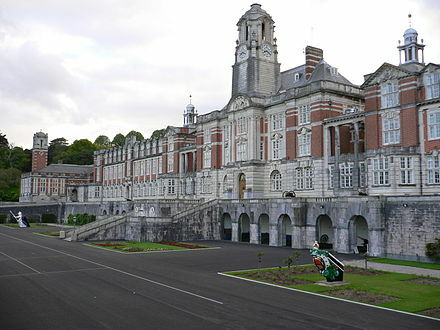 Royal Navy official writings describe Navy Command Headquarters both as a physical site, on Whale Island, a collective formed of the most senior RN officers, and as a budgetary grouping. HMS Achates was an Acasta -class destroyer of the British Royal Navy. She was built by the Scottish shipbuilder John Brown and was built between 192 and 1913. Like all Acasta-class destroyers, Achates was armed with three 4-inch (102 mm) guns and two torpedo tubes, with a specified speed of 29 knots. ↑ Tittler, Robert; Jones, Norman L. (15 April 2008). A Companion to Tudor Britain. John Wiley & Sons. p. 193. ISBN 9781405137409. ↑ Hyde-Price, European Security, pp. 105–106. ↑ "The Royal Navy: Britain's Trident for a Global Agenda". Henry Jackson Society. 4 November 2006. Archived from the original on 11 September 2016. Retrieved 4 November 2006. 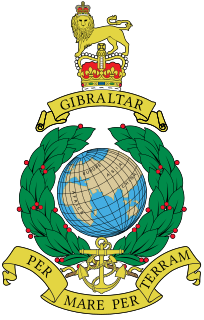 Britannia, with her shield and trident, is the very symbol, not only of the Royal Navy, but also of British global power. In the last instance, the Royal Navy is the United Kingdom's greatest strategic asset and instrument. As the only other 'blue-water' navy other than those of France and the United States, its ballistic missile submarines carry the nation's nuclear deterrent and its aircraft carriers and escorting naval squadrons supply London with a deep oceanic power projection capability, which enables Britain to maintain a 'forward presence' globally, and the ability to influence events tactically throughout the world. ↑ Axe, David (10 August 2016). The Decline of the Royal Navy Archived 27 September 2017 at the Wayback Machine . Originally on Reuters. Retrieved 26 September 2017. ↑ Glaze, Ben (4 September 2017). Armed Forces recruitment crisis sees military "running to stand to still", warns report ordered by Downing Street Archived 7 September 2017 at the Wayback Machine . Mirror . Retrieved 26 September 2017. ↑ Getting ship shape: IfM develops a fleet management tool for the Royal Navy Archived 26 August 2016 at the Wayback Machine , University of Cambridge. ↑ "What we do". Royal Navy. Archived from the original on 30 December 2017. Retrieved 30 December 2017. ↑ Rodger, Safeguard, pp. 18–30. ↑ Swanton, pp. 154–165, 160–172. ↑ Rodger, Safeguard, pp. 35–49. ↑ Roger, N. (1997). The Safeguard of the Sea, A Naval History of Britain 660–1649. London: HarperCollins Publishers Ltd. pp. 38–39. ↑ Stanton, Charles (2015). Medieval Maritime Wartime. South Yorkshire: Pen & Sword Maritime. pp. 225–226. ↑ Michael, Swanton (1069). Anglo-Saxon Chronicle. London. pp. 202–204. ↑ Stanton, Charles (2015). Medieval Maritime Warfare. South Yorkshire: Pen & Sword Maritime. p. 226. ↑ Rodger, Safeguard, pp. 52–53, 117–130. 1 2 Wendover, Roger of (1849). Flowers of History. London: Henry G. Bohn Publishing. pp. 308, 329, 334–339, 340–341. ↑ Michel, F. (1840). Historie des Dues de Normandie et des Rois d'Angleterre. Paris. pp. 172–177. ↑ Historie des Ducs de Normandie. pp. 183–185. ↑ Stanton, Charles (2015). Medieval Maritime Warfare. Pen & Sword Maritime. p. 232. ↑ Historie des Ducs de Normandie. pp. 198–205. 1 2 P. F. Tytler, History of Scotland, Volume 2 (London: Black, 1829), pp. 309–310. ↑ N. A. M. Rodger, The Safeguard of the Sea: A Naval History of Britain 660–1649 (London: Penguin UK, 2004), ISBN 0-14-191257-X, pp. 74–75. ↑ P. J. Potter, Gothic Kings of Britain: the Lives of 31 Medieval Rulers, 1016–1399 (Jefferson, NC: McFarland, 2008), ISBN 0-7864-4038-4, p. 157. ↑ A. Macquarrie, Medieval Scotland: Kinship and Nation (Thrupp: Sutton, 2004), ISBN 0-7509-2977-4, p. 153. 1 2 3 4 N. A. M. Rodger, The Safeguard of the Sea: A Naval History of Britain. Volume One 660–1649 (London: Harper, 1997) pp. 74–90. ↑ Rodger, Safeguard, pp. 93–99. ↑ Rodger, Safeguard, pp. 91–97, 99–116, 143–144. ↑ Nelson, Tudor Navy, p. 36. 1 2 3 4 J. Grant, "The Old Scots Navy from 1689 to 1710", Publications of the Navy Records Society, 44 (London: Navy Records Society, 1913–14), pp. i–xii. 1 2 S. Murdoch, The Terror of the Seas? : Scottish Maritime Warfare, 1513–1713 (Leiden: Brill, 2010), ISBN 90-04-18568-2, p. 10. ↑ E. P. Statham, Privateers and Privateering (Cambridge University Press, 2011), ISBN 110802629X, pp. 19–20. ↑ N. Tranter, The Story of Scotland (Neil Wilson, 2012), ISBN 1906476683. ↑ Childs, David (17 September 2009). Tudor Sea Power: The Foundation of Greatness. Seaforth Publishing. p. 298. ISBN 9781473819924. ↑ Rodger, Safeguard, pp. 221–237. ↑ Rodger, Safeguard, pp. 238–253, 281–286, 292–296. ↑ "Spanish Armada set sail". History. Archived from the original on 25 January 2019. Retrieved 25 January 2019. ↑ Tenace, Edward (2003). "A Strategy of Reaction: The Armadas of 1596 and 1597 and the Spanish Struggle for European Hegemony". English Historical Review. Oxford Journals. 118 (478): 882. ↑ Rodger, Safeguard, pp. 349–363. ↑ Rodger, Safeguard, pp. 379–394, 482. ↑ Rodger, Command, pp. 2–3, 216–217, 607. ↑ Rodger, Command, pp. 6–8. ↑ Rodger, Command, pp. 12–16. ↑ Rodger, Command, pp. 16–18. ↑ A. P. van Vliet, "The influence of Dunkirk privateering on the North Sea (herring) fishery during the years 1580–1650", in J. Roding and L. Heerma van Voss (eds. 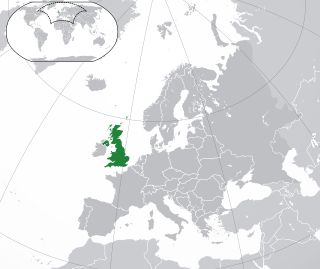 ), The North Sea and Culture (1550–1800) (Leiden 1996), 150–165, esp. 156. ↑ Derrick, Charles (1806). "Memoirs of the rise and progress of the Royal Navy". Archived from the original on 30 December 2017. Retrieved 30 December 2017. ↑ Rodger, Command, pp. 67–76. ↑ Rodger, Command, pp. 76–77. ↑ Rodger, Command, pp. 80–85. ↑ Rodger, Command, pp. 88–91. ↑ Rodger, Command, pp. 142–152, 607–608. 1 2 S. Murdoch, The Terror of the Seas? : Scottish Maritime Warfare, 1513–1713 (Leiden: Brill, 2010), ISBN 90-04-18568-2, pp. 33–34. ↑ M. Merriman, The Rough Wooings (Tuckwell, 2000), p. 181. ↑ S. Murdoch, The Terror of the Seas? : Scottish Maritime Warfare 1513–1713 (Leiden: Brill, 2010), ISBN 9004185682, p. 50. ↑ J. E. A. Dawson, Scotland Re-Formed, 1488–1587 (Edinburgh: Edinburgh University Press, 2007), ISBN 0748614559, pp. 181–182. 1 2 S. Murdoch, The Terror of the Seas? : Scottish Maritime Warfare, 1513–1713 (Leiden: Brill, 2010), ISBN 90-04-18568-2, p. 172. ↑ N. A. M. Rodger, The Safeguard of the Sea: A Naval History of Britain 660–1649 (London: Penguin UK, 2004), ISBN 0140297243, p. 197. ↑ John Strype, Ecclesiastical Memorials, vol. 3, part 2 (Oxford, 1822), p. 81. ↑ John Strype, Ecclesiastical Memorials, vol. 3 part 2 (Oxford, 1822), pp. 67–69, 86–87, and G. Buchanan, History of Scotland, trans Aikman, vol. 2 (1827), 396, bk. 16, cap. 19: R. Holinshed, Raphael, Chronicles: Scotland, vol. 5 (1808), p. 585. ↑ S. Murdoch, The Terror of the Seas? : Scottish Maritime Warfare, 1513–1713 (Leiden: Brill, 2010), ISBN 90-04-18568-2, p. 169. ↑ S. Murdoch, The Terror of the Seas? : Scottish Maritime Warfare, 1513–1713 (Leiden: Brill, 2010), ISBN 90-04-18568-2, p. 168. ↑ S. Murdoch, The Terror of the Seas? : Scottish Maritime Warfare, 1513–1713 (Leiden: Brill, 2010), ISBN 90-04-18568-2, p. 174. 1 2 J. Grant, "The Old Scots Navy from 1689 to 1710", Publications of the Navy Records Society, 44 (London: Navy Records Society, 1913–14), p. 48. ↑ Rodger, Command, p. 608. ↑ Rodger, Command, pp. 291–311, 408–425, 473–476, 484–488. ↑ Rodger, Command, pp. 164–180. ↑ Beatson, Memoirs, pp. 25–27. ↑ Coxe, William. Memoirs of the kings of Spain of the House of Bourbon, Volume 3, London 1815. Coxe gives the overall loss of the expedition during the campaign as 20,000 lives lost; Reed Browning considers this "not implausible", p. 382. ↑ Rodger, Command, pp. 234–256. ↑ Rodger, Command, pp. 263–279, 284. ↑ Rodger, Command, pp. 277–283. ↑ Rodger, Command, pp. 284–287. ↑ Rodger, Command, pp. 330–351. ↑ Rodger, Command, pp. 351–352. ↑ Rodger, Command, pp. 353–357. ↑ Parkinson, C. Northcote, Britannia Rules – the classic age of naval history 1793–1815 (1977), pp. 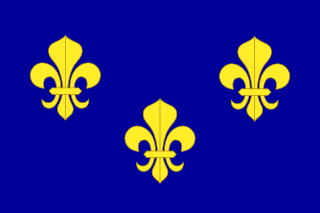 15–19; Rodger, Command, pp. 427–433. ↑ Parkinson, pp. 33–37, 45–49; Rodger, Command, pp. 435–436, 438–440, 456, 463. ↑ Parkinson, pp. 40–45; Rodger, Command, pp. 445–450. ↑ Parkinson, pp. 54–61; Rodger, Command, pp. 457–461. ↑ Parkinson, pp. 75–82; Rodger, Command, pp. 468–471. ↑ Parkinson, pp. 82–84; Rodger, Command, pp. 428–429, 435–436, 472. ↑ Parkinson, pp. 91–114; Rodger, Command, pp. 528–544. ↑ Parkinson, pp. 114, 117–118, 131–140; Rodger, Command, pp. 542–543, 545–548, 555–557. ↑ Parkinson, pp. 120–121; Rodger, Command, p. 549. ↑ Rodger, Command, pp. 564–572. ↑ Rodger, Command, p. 562. ↑ "How did Britain come to rule the waves?". History Extra. Archived from the original on 7 March 2019. Retrieved 6 March 2019. ↑ Staff (6 January 1859). "English and American Navies". New York Herald (reprint appearing in The Olney Times). Archived from the original on 27 August 2016. Retrieved 22 August 2015– via Newspapers.com. 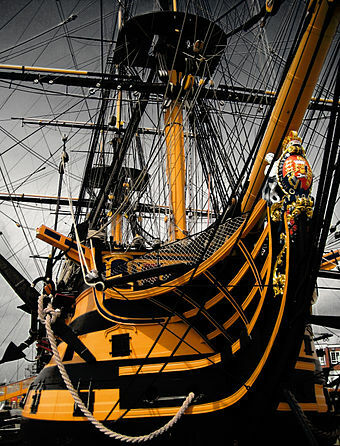 ↑ "A Brief History of Piracy | Online Information Bank | Research Collections | Royal Naval Museum at Portsmouth Historic Dockyard". Royalnavalmuseum.org. Archived from the original on 12 June 2011. Retrieved 28 December 2011. ↑ Bloy, Marjie (2002). "Cardwell's Army Reforms 1870—1881". Archived from the original on 4 August 2016. Retrieved 10 September 2016. ↑ "Distant Victory: The Battle of Jutland and the Allied Triumph in the First World War, page XCIV". Praeger Security International. July 2006. Retrieved 30 May 2016. ↑ Jose, Arthur (1941) . "Chapter 9, Service Overseas, East Africa, Dardanelles, North Atlantic" (PDF). The Royal Australian Navy, 1914–1918. 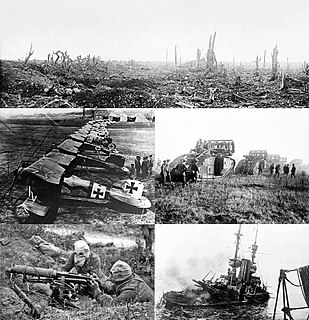 Official History of Australia in the War of 1914–1918. IX (9th ed.). Canberra: Australian War Memorial. OCLC 271462423 . Retrieved 22 February 2017. ↑ "British naval convoy system introduced". History. Archived from the original on 31 December 2017. Retrieved 30 December 2017. ↑ "The Washington Naval Conference, 1921–1922". Office of the historian. Archived from the original on 29 December 2017. Retrieved 1 January 2018. ↑ "Respectful rebels: The Invergordon Mutiny and Granny's MI5 file". BBC. 20 December 2016. Archived from the original on 28 October 2018. Retrieved 1 January 2018. ↑ "The History of the Fleet Air Arm Officers Association, FAAOA". fleetairarmoa.org. Archived from the original on 18 April 2012. Retrieved 8 June 2015. 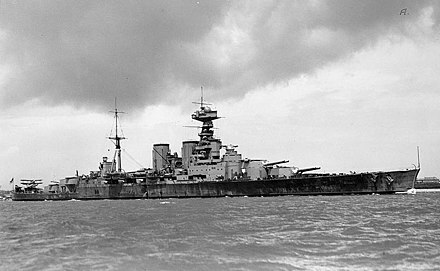 ↑ "Royal Navy in 1939 and 1945". Naval-history.net. 8 September 1943. Archived from the original on 1 September 2016. Retrieved 28 December 2011. ↑ "1939 – Navy lists". National Library of Scotland. Retrieved 21 February 2016. ↑ Baron, Scott; Wise, James E. (2004). Soldiers lost at sea: a chronicle of troopship disasters. Naval Institute Press. p. 100. ISBN 1-59114-966-5. Archived from the original on 5 May 2016. Retrieved 29 October 2015. ↑ Fenton, Norman (17 February 2011). "The Sinking of the 'Scharnhorst', Wreck discovery". BBC. Archived from the original on 28 June 2012. Retrieved 2 July 2012. 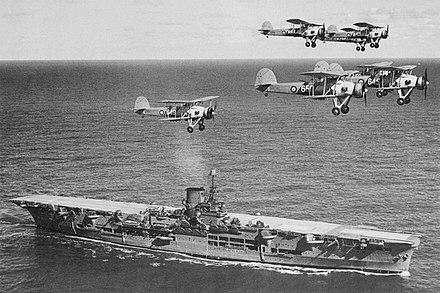 ↑ "Operation Pedestal". Melbourne Star. Archived from the original on 23 December 2017. Retrieved 30 December 2017. 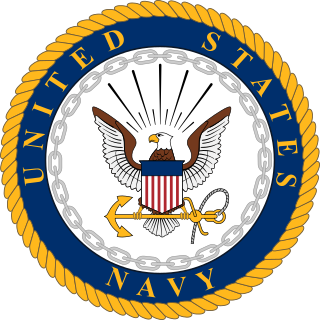 ↑ "(339) – Navy lists > 1913–1921, 1944–1945 – Quarterly > 1945 > July > Volume 3". National Library of Scotland. Retrieved 21 February 2016. ↑ Kennedy, 1989, pp. 570–571. ↑ Purvis, M. K. (1974). Post War RN Frigate and Guided Missile Destroyer Design 1944–1969. Royal Institution of Naval Architects (RINA). ↑ "Has the time come to the move the cost of Trident replacement out of the MoD budget?". Save the Navy. 27 November 2017. Archived from the original on 31 December 2017. Retrieved 30 December 2017. ↑ "HMS Antrim". World Naval Ships. Archived from the original on 8 August 2014. Retrieved 30 December 2017. ↑ "Cod Wars". National Archives. Archived from the original on 16 November 2017. Retrieved 1 January 2018. 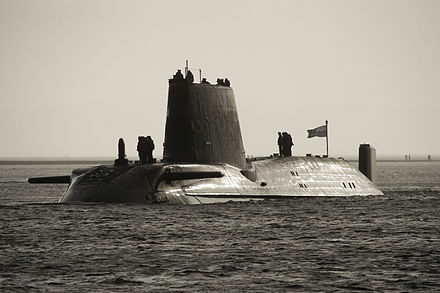 ↑ "1982: British sub sinks Argentine cruiser". BBC News. 2 May 1982. Archived from the original on 30 May 2018. Retrieved 30 December 2017. ↑ "We were heading for war...and the Commons blamed me". The Daily Telegraph. London. 1 March 2002. Archived from the original on 18 July 2006. Retrieved 10 August 2007. ↑ John Ingham. "Royal Navy is now 'too small' to protect Britain". Express. Archived from the original on 23 October 2014. Retrieved 23 November 2014. ↑ Sengupta, Kim (13 November 2008). "Marines kill two Somalis in raid on pirate vessel". The Independent . Archived from the original on 20 August 2009. Retrieved 15 November 2008. ↑ "Former RN flagship HMS Illustrious to be sold for scrap". The Register. 22 August 2016. Archived from the original on 30 December 2017. Retrieved 30 December 2017. ↑ "Royal Navy could lose its two amphibious assault ships in cuts". The Guardian. 5 October 2017. Archived from the original on 29 December 2017. Retrieved 30 December 2017. ↑ 31/12/2013 (31 December 2013). 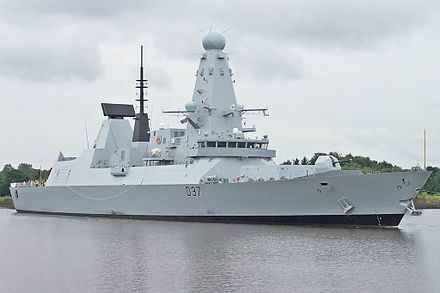 "Royal Navy's final Type 45 destroyer enters service early". Royal Navy. Archived from the original on 12 June 2018. Retrieved 26 September 2018. ↑ "HMS Richmond and HMS Enterprise rescue 541 migrants from the Med Archived 2 May 2018 at the Wayback Machine ". The Daily Telegraph . 29 October 2015. ↑ "A guide to the Dreadnought class nuclear submarine". UK Defence Journal. 3 January 2018. Archived from the original on 5 March 2018. Retrieved 27 March 2018. ↑ "First Type 26 frigate named HMS Glasgow – BBC News". Bbc.co.uk. Archived from the original on 15 June 2018. Retrieved 26 September 2018. 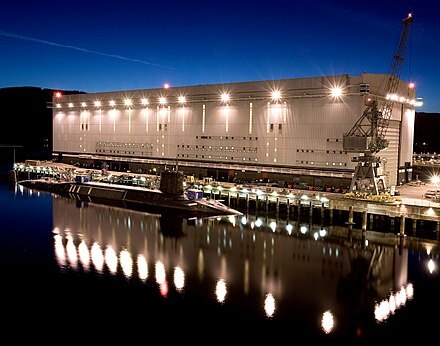 ↑ "Ambitious future for Naval Shipbuilding in the UK". GOV.UK. 6 September 2017. Archived from the original on 16 March 2018. Retrieved 26 September 2018. ↑ "First woman wins Marines' green beret". The Telegraph. 1 June 2002. Archived from the original on 9 August 2017. Retrieved 30 December 2017. ↑ gov.uk MoD – regular personnel Archived 2 April 2015 at the Wayback Machine , table 2, p. 8. 1 January 2015. ↑ gov.uk MoD – quarterly personnel report Archived 21 April 2016 at the Wayback Machine , table 2, p. 7. 1 January 2015. ↑ dasa.mod – reserves and cadet strengths Archived 3 December 2013 at the Wayback Machine , table 2, p. 4. April 2012. ↑ dasa.mod – reserves and cadet strengths Archived 2 February 2014 at the Wayback Machine , table 2-page 12. See note 2. April 2013. ↑ gov.uk MoD – reserves and cadet strengths Archived 8 March 2016 at the Wayback Machine , table 2, p. 11. April 2014. 1 2 "Royal Navy arrives in British Virgin Islands bringing much-needed aid to the Hurricane Irma-ravaged territory". The Telegraph. 9 September 2017. Archived from the original on 31 December 2017. Retrieved 30 December 2017. ↑ "BAE to cut possibly more than 1,000 UK shipyard jobs". BBC. Archived from the original on 6 November 2013. Retrieved 5 November 2013. 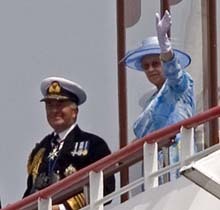 ↑ "Queen Elizabeth Due To Set Sail From Rosyth today". BBC News. 26 June 2017. Archived from the original on 26 June 2017. Retrieved 26 June 2017. ↑ "Key facts about the Queen Elizabeth Class" (PDF). Aircraft Carrier Alliance. Archived (PDF) from the original on 28 July 2017. Retrieved 12 July 2017. ↑ "Iconic structure is installed on HMS Prince of Wales". Archived from the original on 2 July 2017. Retrieved 12 July 2017. ↑ "Australia to buy used UK landing ship". Sydney Morning Herald. 6 April 2011. Archived from the original on 9 October 2016. Retrieved 9 September 2016. ↑ "Royal Navy unveils new Amphibious landing ships". Ministry of Defence. 6 October 2006. Archived from the original on 15 August 2007. Retrieved 10 August 2007. ↑ "Royal Navy information". MOD. Archived from the original on 14 August 2007. Retrieved 10 August 2007. ↑ "Type 45 Destroyer". BAE Systems. Archived from the original on 15 October 2007. Retrieved 2 November 2007. ↑ Grafton became Almirante Lynch, Marlborough became Almirante Condell, Norfolk became Almirante Cochrane "Type 23 Duke class – Helicopter Database". helis.com. Archived from the original on 31 August 2016. Retrieved 23 March 2013. ↑ "Strategic Defence and Security Review – Securing Britain in an Age of Uncertainty" (PDF). Ministry of Defence. Archived from the original (PDF) on 22 December 2010. Retrieved 1 July 2011. ↑ "New offshore patrol vessels for Royal Navy". Ministry of Defence. 6 November 2013. Archived from the original on 27 August 2016. Retrieved 6 November 2013. ↑ "First steel cut on new patrol ships". Ministry of Defence. 10 October 2014. Archived from the original on 27 August 2016. Retrieved 11 October 2014. The first of the new OPVs will be named HMS Forth and is expected to be handed over to the Royal Navy in 2017. The second will be named HMS Medway and the third HMS Trent. ↑ "£287M for two more Royal Navy ships as work begins on the next – News stories – GOV.UK". www.gov.uk. Archived from the original on 2 February 2017. Retrieved 24 January 2017. 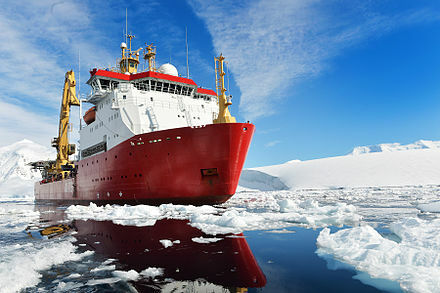 ↑ "HMS Protector ready". Think Defence. 26 May 2011. Archived from the original on 13 February 2016. Retrieved 27 September 2013. ↑ "Echoes of a varied history – HMS Echo, ship of the month May 2004 (archive)". Navy News. Archived from the original on 19 July 2008. Retrieved 20 June 2009. ↑ "Royal Navy Submarine School". Royal Navy. 10 April 2012. Archived from the original on 19 April 2012. Retrieved 2 March 2016. ↑ "MOD Awards £800m Contract For Submarine Propulsion Programme". Royal Navy. 13 February 2013. Archived from the original on 30 December 2017. Retrieved 30 December 2017. ↑ Knight, Will (5 December 2006). "UK unveils plans for a new submarine fleet". New Scientist (Environment). Archived from the original on 8 December 2008. Retrieved 10 August 2007. ↑ "Royal Navy to Get New Attack Submarine". Royal Navy. 21 May 2007. Archived from the original on 9 October 2007. Retrieved 10 October 2007. ↑ "HMS Artful commissioned in Royal Navy ceremony". Yorkshire Post. 19 March 2016. Archived from the original on 31 March 2016. Retrieved 19 March 2016. ↑ "UK MoD begins training helicopter acquisition". Flight Global. 10 September 2014. Archived from the original on 30 December 2017. Retrieved 30 December 2017. ↑ "809 Air Squadron". Royal Navy. Archived from the original on 29 March 2014. Retrieved 23 November 2014. 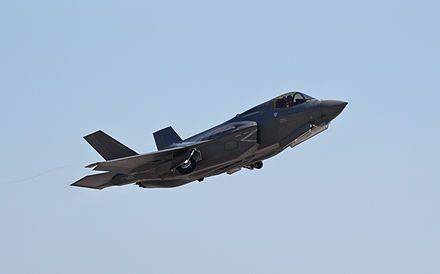 ↑ "HMS Queen Elizabeth to get first F-35 jets next year". UK Defence Journal. 26 April 2017. Archived from the original on 30 December 2017. Retrieved 30 December 2017. ↑ Paul, James; Spirit, Martin (2000). "The Special Boat Service". Britain's Small Wars Site Index. Archived from the original on 4 March 2010. Retrieved 9 March 2010. ↑ "Royal Marines train in Californian desert". Archived from the original on 18 October 2012. Retrieved 23 November 2014. ↑ "Royal Netherlands Marine Corps | Royal Navy". Archived from the original on 29 April 2012. ↑ "HMNB Devonport". Archived from the original on 8 January 2007. ↑ "HMNB Portsmouth". Royal Navy. Archived from the original on 30 December 2017. Retrieved 30 December 2017. ↑ "HMNB Clyde". Royal Navy. Archived from the original on 30 December 2017. Retrieved 30 December 2017. ↑ "Joint operations". Royal Navy. Archived from the original on 24 June 2007. Retrieved 7 August 2007. ↑ "Core Capabilities". Royal Navy. Archived from the original on 9 June 2007. Retrieved 7 August 2007. ↑ "HMS Clyde". Royal Navy. Archived from the original on 17 April 2015. Retrieved 8 June 2014. ↑ Cougar Archived 11 December 2010 at the Wayback Machine . Royal Navy. Retrieved on 18 September 2011. ↑ Ministry of Defence | Defence News | Training and Adventure | Royal Navy ready for unforeseen global events Archived 13 May 2011 at the Wayback Machine . Mod.uk (20 February 2007). Retrieved on 18 September 2011. ↑ Operations in the Gulf Archived 8 February 2011 at the Wayback Machine . Royal Navy. Retrieved on 18 September 2011. ↑ United Kingdom Component Command UKMCC Archived 8 February 2011 at the Wayback Machine . Royal Navy (15 June 2010). Retrieved on 18 September 2011. ↑ Commanding Officer Archived 8 February 2011 at the Wayback Machine . Royal Navy. Retrieved on 18 September 2011. ↑ Five Power Defence Arrangements (FPDA) Archived 14 March 2011 at the Wayback Machine . Ukinmalaysia.fco.gov.uk (3 March 2009). Retrieved on 18 September 2011. ↑ European Union Naval Force Somalia – Operation Atalanta Archived 6 May 2010 at the Wayback Machine . Eunavfor.eu. Retrieved on 18 September 2011. ↑ "New title for Duke of Edinburgh as he turns 90". BBC news. BBC. 10 June 2011. Archived from the original on 13 June 2011. Retrieved 10 June 2011. ↑ "Allied Maritime Command – Standing Forces". NATO. Archived from the original on 6 May 2016. Retrieved 8 May 2016. ↑ "Second Sea Lord". Royal Navy. Archived from the original on 10 June 2016. Retrieved 17 June 2016. ↑ "Senior Naval Staff". Archived from the original on 17 April 2014. Retrieved 23 November 2014. ↑ "Defence Intelligence: Roles". Ministry of Defence. 12 December 2012. Archived from the original on 5 November 2014. Retrieved 4 November 2014. ↑ "HMNB Devonport". The Royal Navy. Archived from the original on 17 October 2007. Retrieved 18 October 2007. 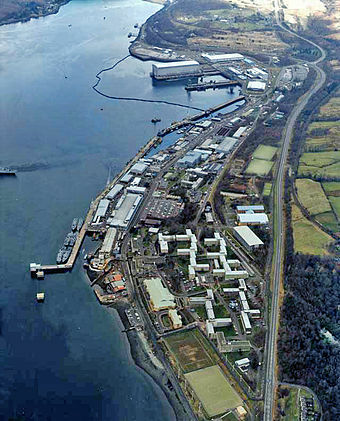 ↑ "Royal Navy Dockyards". National Maritime Museum. Archived from the original on 30 September 2007. Retrieved 10 August 2007. ↑ Vice-Admiral Sir Jeremy Blackham (13 March 2007). "The Royal Navy at the Brink" (PDF). 1. Royal United Services Institute. Archived from the original (PDF) on 10 July 2007. Retrieved 10 August 2007. ↑ "Devonport 'secure' says minister". BBC. 25 July 2007. Retrieved 10 August 2007. ↑ "HMS Raleigh: history". Royal Navy. Archived from the original on 17 September 2017. Retrieved 17 September 2017. ↑ "UK-Bahrain sign landmark defence agreement". Foreign & Commonwealth Office. 5 December 2014. Archived from the original on 9 December 2014. Retrieved 6 December 2014. ↑ "UK to establish £15m permanent Mid East military base". BBC News. 6 December 2014. Archived from the original on 24 November 2017. Retrieved 6 December 2014. ↑ "East of Suez, West from Helmand: British Expeditionary Force and the next SDSR" (PDF). Oxford Research Group. December 2014. Archived from the original (PDF) on 2 July 2015. Retrieved 22 May 2015. ↑ Randier, Jean (2006). La Royale : L'histoire illustrée de la Marine nationale française. ISBN 978-2-35261-022-9. ↑ "HMS Daring". Royal Navy. Archived from the original on 13 September 2012. Retrieved 15 September 2012. ↑ "The French Navy and the Men Who Commanded It: Captains Who Served in the French Navy during the period 1791–1815". Napoleon Series. Archived from the original on 7 January 2018. Retrieved 30 December 2017. ↑ "Use of the Union Jack at Sea". Flags of the World. Archived from the original on 9 June 2007. Retrieved 14 July 2007. ↑ "French top gun at Fleet Review". The Times. London. 26 June 2005. Archived from the original on 29 June 2011. Retrieved 12 July 2007. ↑ Admiralty Manual of Seamanship. HMSO. 1964. ↑ "FAQs;Royal Navy's nickname". National Maritime Museum. Archived from the original on 29 June 2007. Retrieved 14 July 2007. 1 2 Jolly, Rick. Jackspeak. Maritime Books Dec 2000. ISBN 0-9514305-2-1. ↑ "Naval Slang". Royal Navy. Archived from the original on 2 July 2007. Retrieved 14 July 2007. ↑ "The Basic Rules of Uckers". Archived from the original on 13 February 2009. Retrieved 12 September 2008. ↑ "History". Volunteer Cadet Corps. Archived from the original on 30 December 2017. Retrieved 30 December 2017. ↑ "Royal Navy". Combined Cadet Force. Archived from the original on 30 December 2017. Retrieved 30 December 2017. ↑ "History". Sea Cadets. Archived from the original on 30 December 2017. Retrieved 30 December 2017. ↑ "FOST Royal Navy". www.royalnavy.mod.uk. MOD, 2017. Archived from the original on 28 March 2017. Retrieved 18 March 2017. ↑ Lavery, Brian (2003). Jack Aubrey Commands: An Historical Companion to the Naval World of Patrick O'Brian. Conway Maritime. ISBN 0-85177-946-8. ↑ "Horatio Hornblower". National Maritime Museum. Archived from the original on 16 February 2016. Retrieved 9 February 2016. ↑ "25 things you probably didn't know about James Bond". IGN. Retrieved 30 December 2017. ↑ "Pirates of the Caribbean at IMDb". Archived from the original on 31 January 2018. Retrieved 20 July 2018. ↑ "Warship". IMDB. Archived from the original on 16 April 2017. Retrieved 30 December 2017. ↑ "Devon Shipmates on TV". BBC. Archived from the original on 3 March 2006. Retrieved 19 July 2007. ↑ "Empire of the Seas: How the Navy Forged the Modern World". BBC. Archived from the original on 10 November 2017. Retrieved 30 December 2017. ↑ "Sailor". You Tube. Archived from the original on 7 November 2010. Retrieved 30 December 2017. ↑ "Perisher". You Tube. Retrieved 30 December 2017. ↑ "Royal Navy Submarine Mission". Channel 5. Archived from the original on 30 December 2017. Retrieved 30 December 2017. ↑ "The Navy Lark – BBC Radio 4 Extra". BBC. Archived from the original on 9 April 2016. Retrieved 17 July 2016. 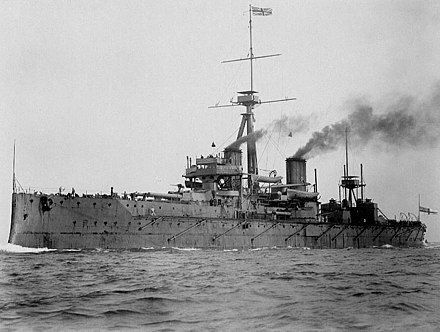 Wikimedia Commons has media related to Royal Navy .